Lake is Rising 6" or so a Day! Grant Lake Marina and Campground ( no reliable phone service here so just stop in): According to Doug and Harold at the marina fishing has been a bit off here probably cuz the lake is rising 6" or so a day due to spring run off which is about at it's peak. We expect that to change for the better as the lake level stabilizes. They asked me to pass along that their privately run campground is booked full from mid June to mid Sept. with openings before and after and they offer a two day boat rental deal that allows folks to stay out later and get going earlier the next morning. On the other hand, Dan's Guide Service (661-478-0036) has been doing well like usual trolling in the eves for 16" to 20" Browns using a Rapala/spin gear or streamer/fly rod set up which are both effective and a fun way to fish Grant. 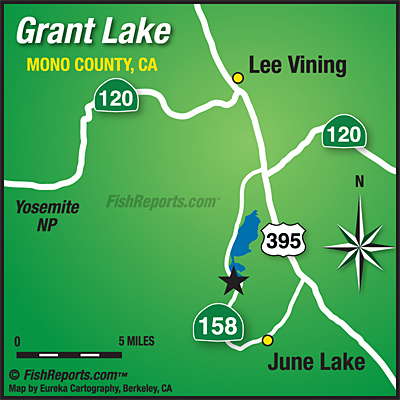 As a note, the near by hike in lakes are clear of snow and ice with great fishing and scenery. June Lake Loop area reports are provided by Scott Champion from Ernies Tackle and Ski Shop in June Lake CA.